Antwerp, Belgium, between 1460 and 1470. Belgian black morocco, ca. 1840. Bequest of Carola Warburg Rothschild, 1987. Nieuwenhoven?, 18th century; Jean Joseph Raepsaet (1750-1832); Aug. Demeunynck, Lille, late 19th century (his Theology no. 23); Felix M. Warburg (d. 1937), New York (de Ricci, Census, II, 1,849, no. 5); his daughter, Carola Warburg (Mrs. Walter N. Rothschild), New York; bequeathed to the Morgan by Mrs. Rothschild at her death in 1987. Ms. book of hours for the use of Windesheim, written and illuminated in Antwerp, Belgium, in the 1460s. Decoration: 6 full-page miniatures (fols. 11v, 20v, 92v, 101v, 113v, 122v, by Lieven van Lathem), and 5 small miniatures and 2 historiated initials (by an anonymous artist). Artist: Lieven van Lathem (ca. 1438-93), and others. 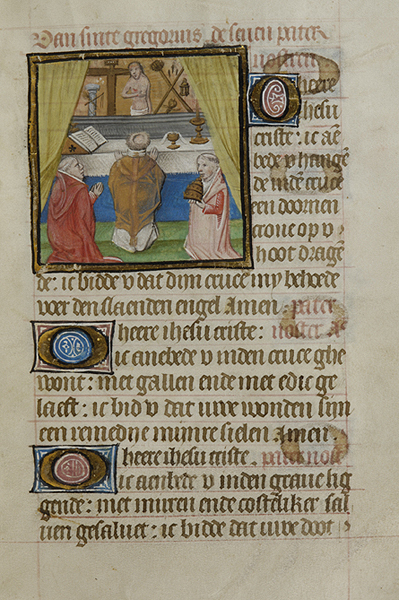 Contents: f. 1v-7: Calendar; f. 8-9: Seven Prayers of St. Gregory; f. 9-11: Prayer to the Name of Jesus, followed by others; f. 12-17v: Hours of the Cross; f. 18-19v: Prayer to Christ; f. 21-54: Hours of the Virgin (Windesheim use); f. 54-58v: Prayer to Sacrament, followed by other prayers; f. 59-80: Penitential Psalms and Litany, preceded by a prayer; f. 80-92: John's Gospel Lesson, followed by prayers; f. 93-100v: Psalms of the Virgin, followed by other prayers; f. 102-109v: Suffrage to Catherine, followed by other prayers; f. 110-113: Prayer to the Virgin, followed by Suffrages; f. 114-121v: Suffrage to Barbara, followed by other prayers including one to the Wounds of Christ; f. 123-130v: Prayer to Peter, followed by other prayers; f. 131-140v: Prayer to the Virgin, followed by others including one to the Sacrament. List of illustrations: f. 8: Mass of St. Gregory; f. 9: Christ Child; f. 11v: Crucifixion; f. 20v: Annunciation; f. 60: Last Judgment; f. 92v: Virgin and Child; f. 101v: St. Catherine; f. 110: Virgin and Child; f. 113v: St. Barbara; f. 115v: Five Wounds of Christ; f. 122v: Christ Appearing to St. Peter; f. 131: Nativity; f. 134: Host in a Monstrance.